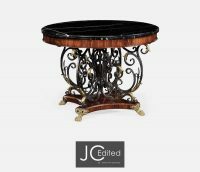 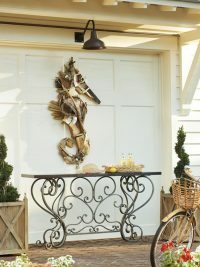 Spectacular black variegated marble topped round centre table, the veneered apron and base enclosing a finely worked wrought iron and brass Baroque style structure of stylised scrolling fronds and leaves. 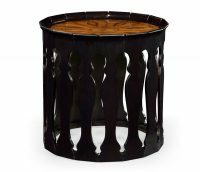 The whole set on lost wax cast lions paw feet. 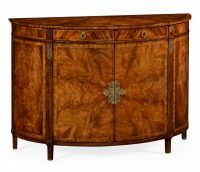 Inspired by a Roman original of c.1650. 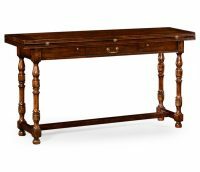 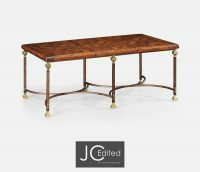 Rectangular topped raised parquetry coffee table with geometric design set above a wrought iron frame with brass capped feet and supports in a dark argentinian walnut finish. 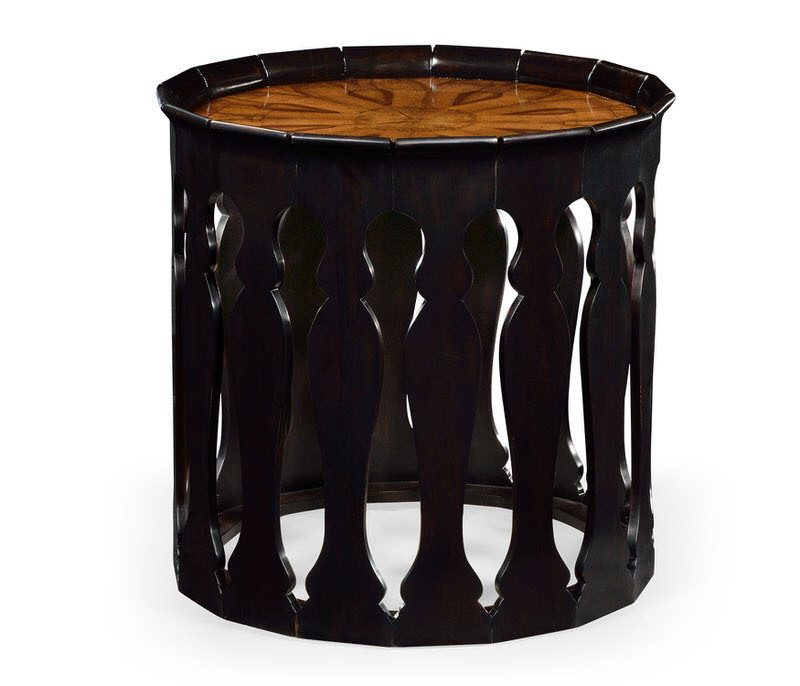 Unusual ebonised side table inspired by Moorish souk furniture, the polygonal top above a band of interlocking columns with an antiqued painted finish. 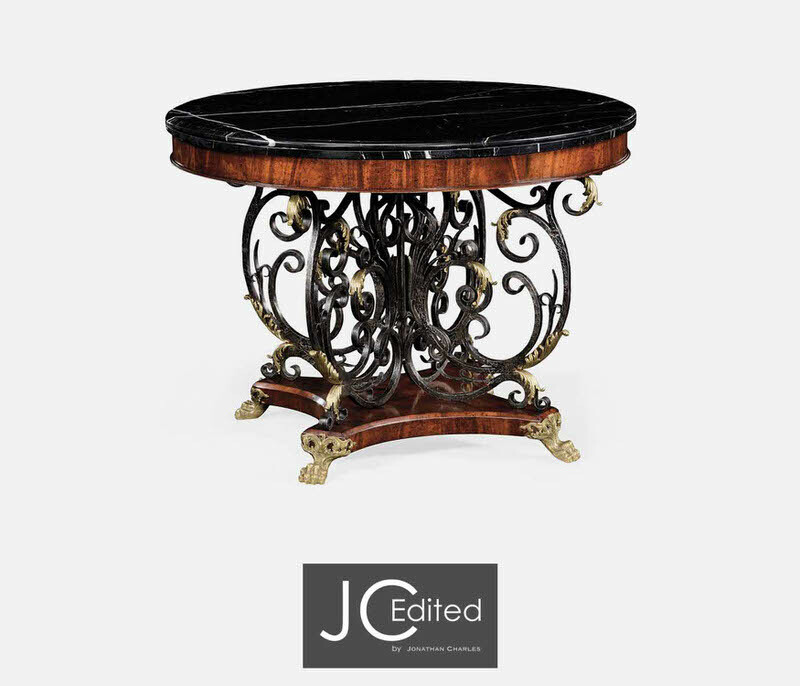 Available in 10 finishes. 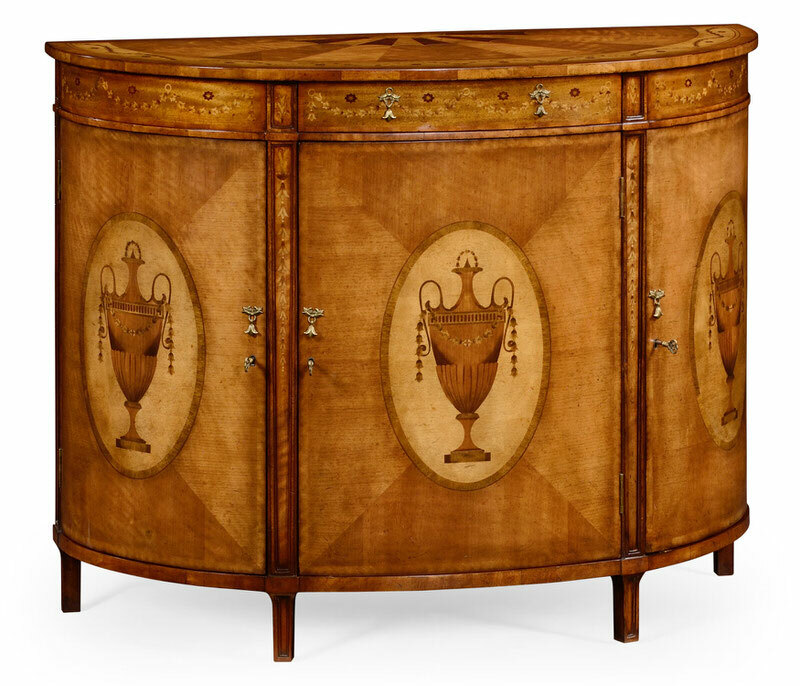 Neo-classical style demilune cabinet with fine walnut and satinwood inlays of floral swags and Grecian urns throughout and elegant brass handles. 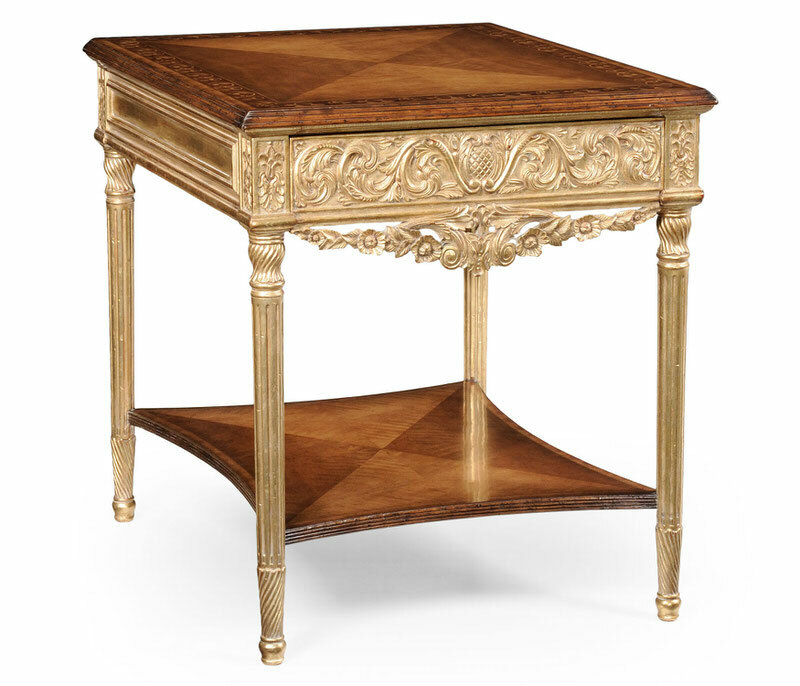 Venetian inspired side table with single drawer, églomisé and intricate hand painted detail throughout, egg and dart moulding and tapering legs with lotus leaf carved details. 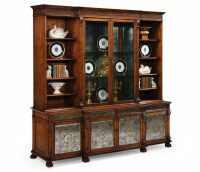 Dark oak substantial side cabinet with stepped pyramidial panelled mouldings to the two drawer fronts and doors, and stylised iron drawer handles and strap hinges. 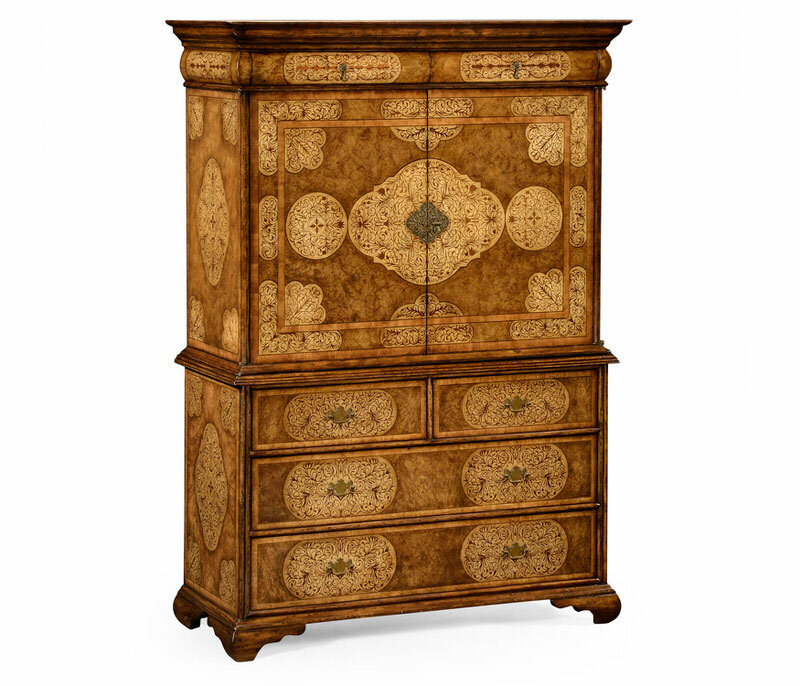 The design based on a transitional piece of c.1600. 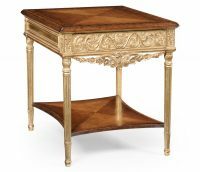 Louis XIV style rectangular side table with gilded drawer front and legs, shaped under-tier and a fine marquetry inlaid satinwood top. 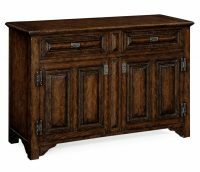 Attractive semi-engaged floral garland to drawer base. 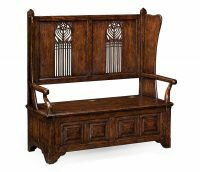 Medieval style heavily distressed dark oak hall settle with hinged seat revealing storage within, the upper section with finely carved and pierced Gothic lancets, and the base with stepped panelling. 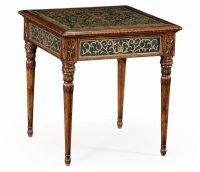 Based on an English 15th century original. 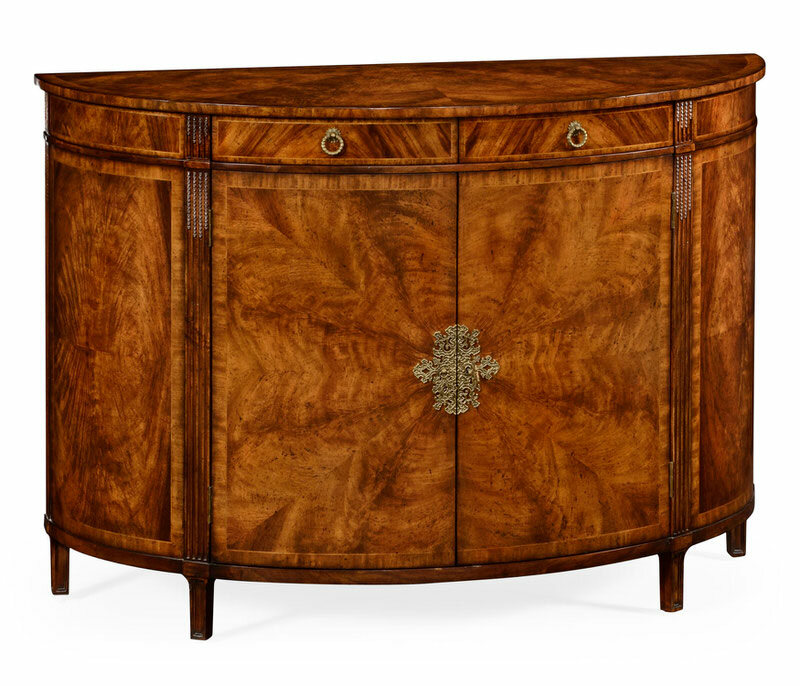 Walnut and crotch walnut veneered demilune sideboard with finely cast patinated brass handle and escutcheon, two drawers and large cupboard with adjustable shelf within. 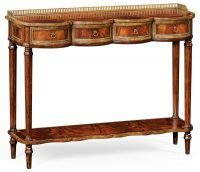 Mahogany scalloped console table with beaded brass and inlaid detail on the drawers and a pierced brass gallery on top. 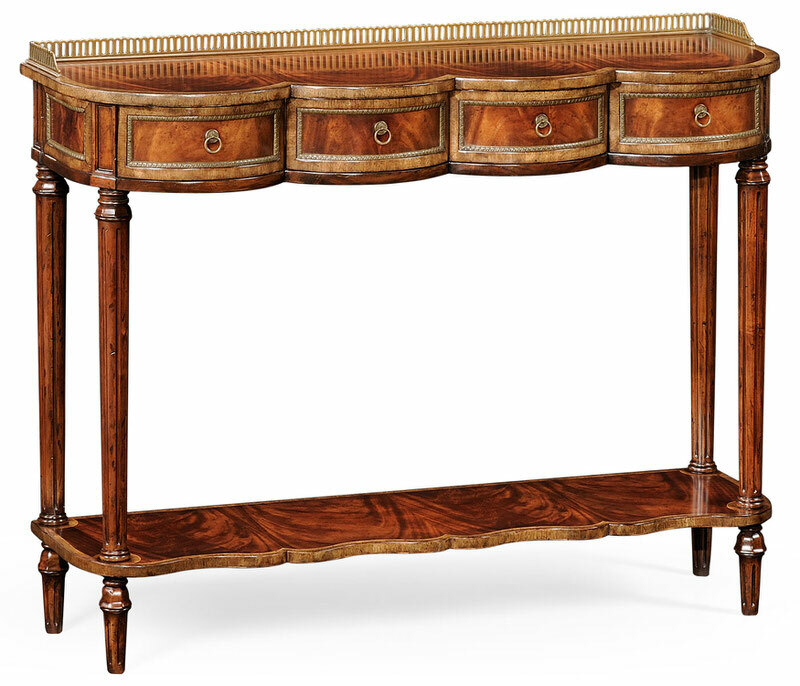 Tapering fluted legs above a mahogany veneered shelf beneath. 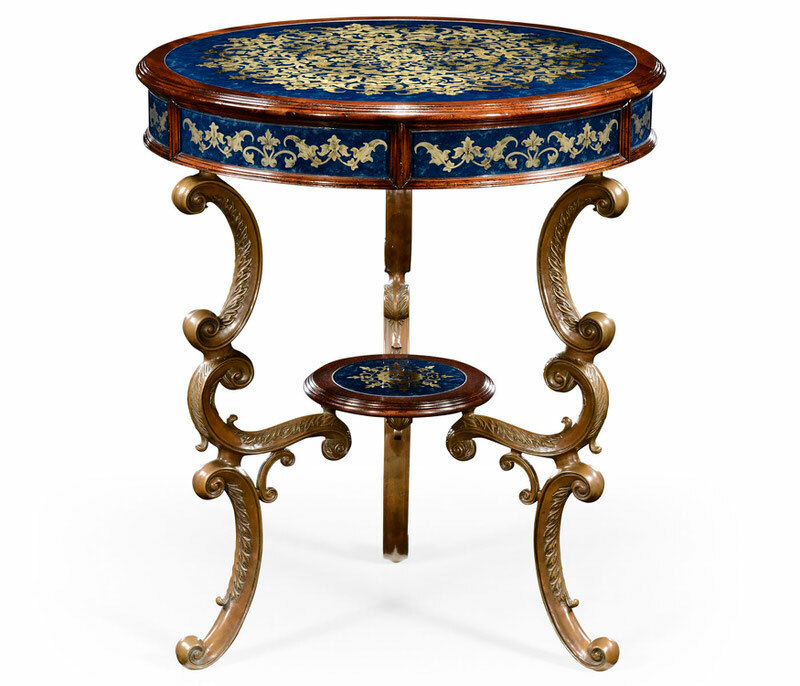 After a mid-Victorian original of c1850. 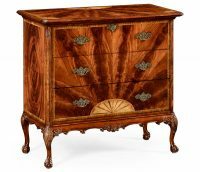 George III style mahogany chest of three drawers with fine sunburst inlay and radiating crotch mahogany veneers to the top and front panel. 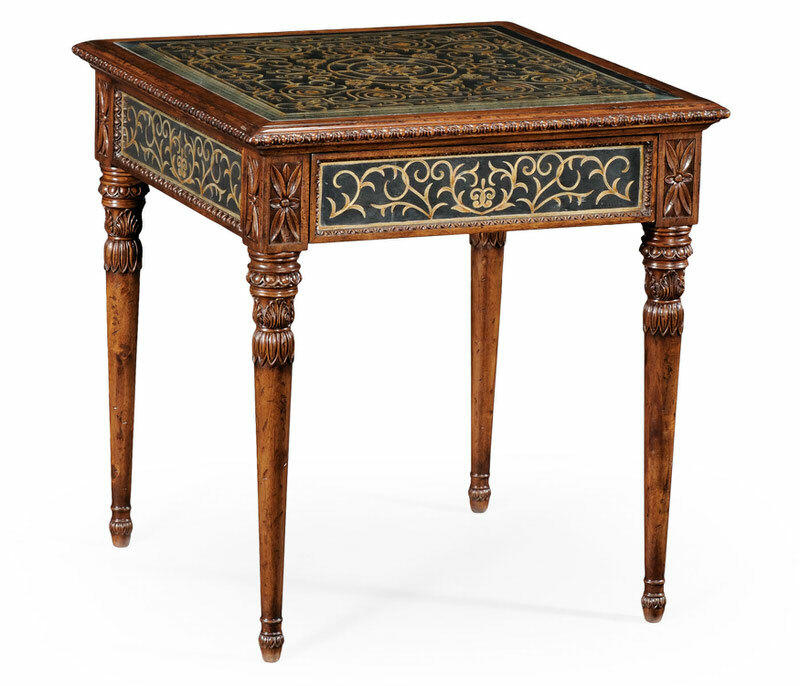 raised on a shallow carved base with cabriole legs on ball-and-claw feet. 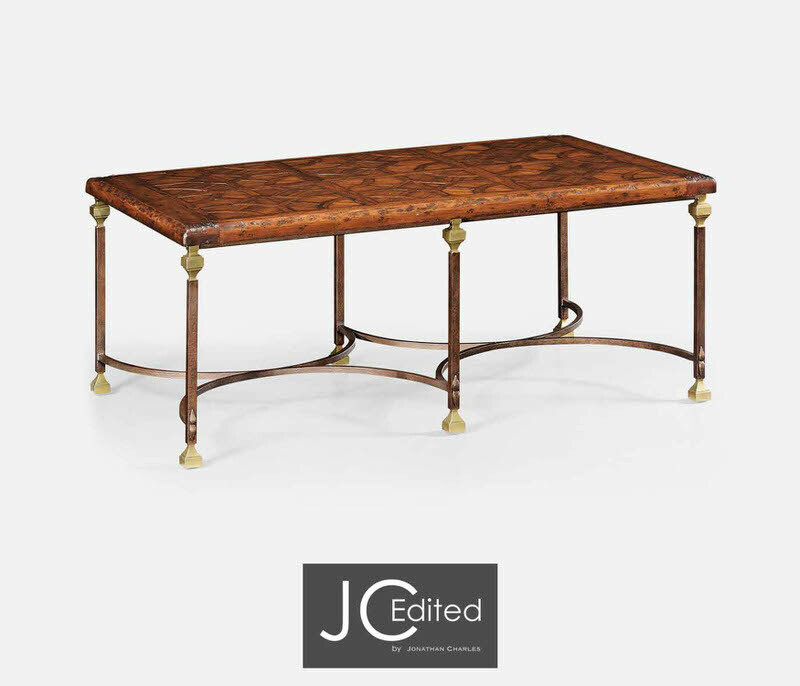 Walnut hunt table that folds out to reveal antique brass hinges and planked top. 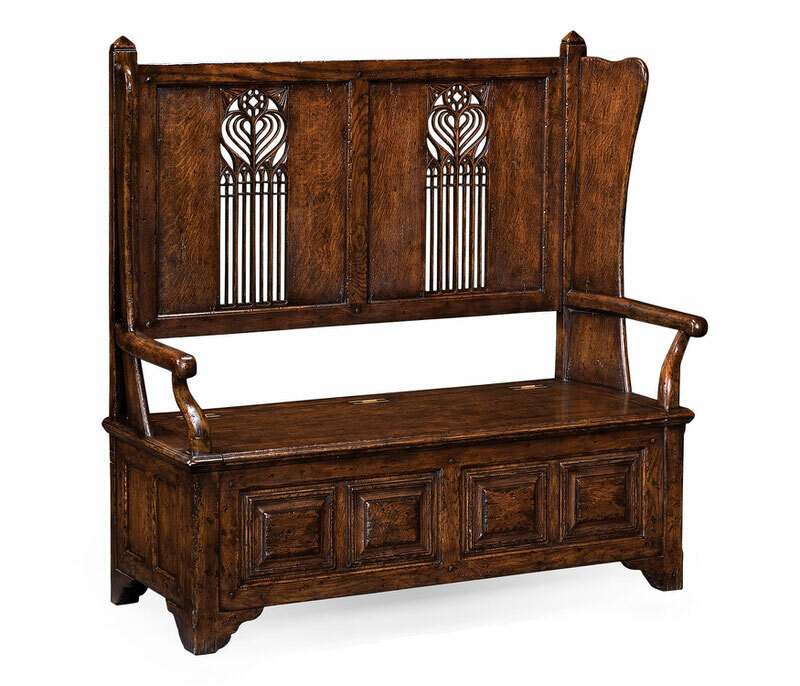 Seats: 6. 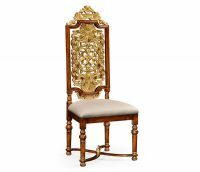 Walnut high backed hall or dining side chair with a crested top rail above a finely carved and pierced back panel of gilded Renaissance style ornament with scrolling floral and shell motifs. 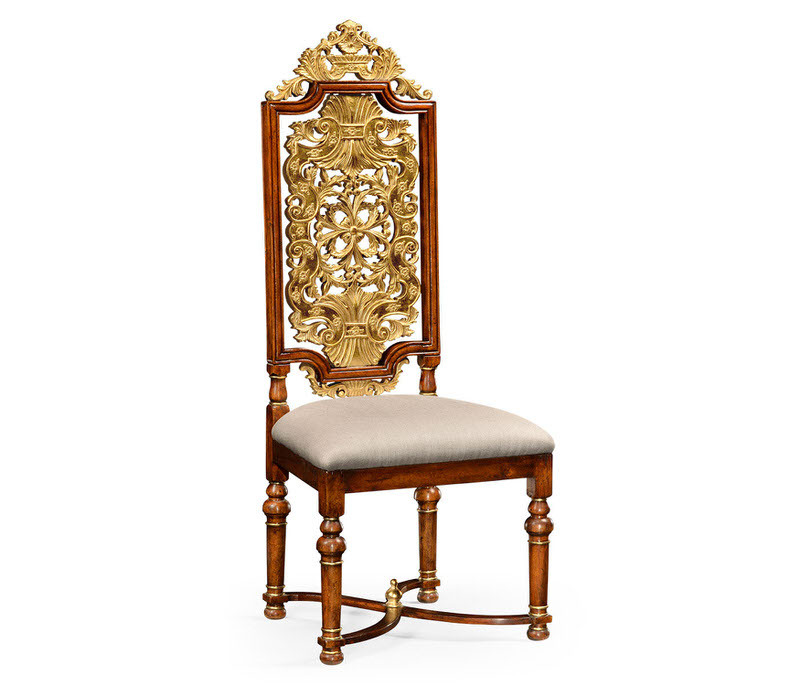 Plain upholstered seat above reeded baluster turned legs linked by an intersecting X-stretcher with gilded urn finial. 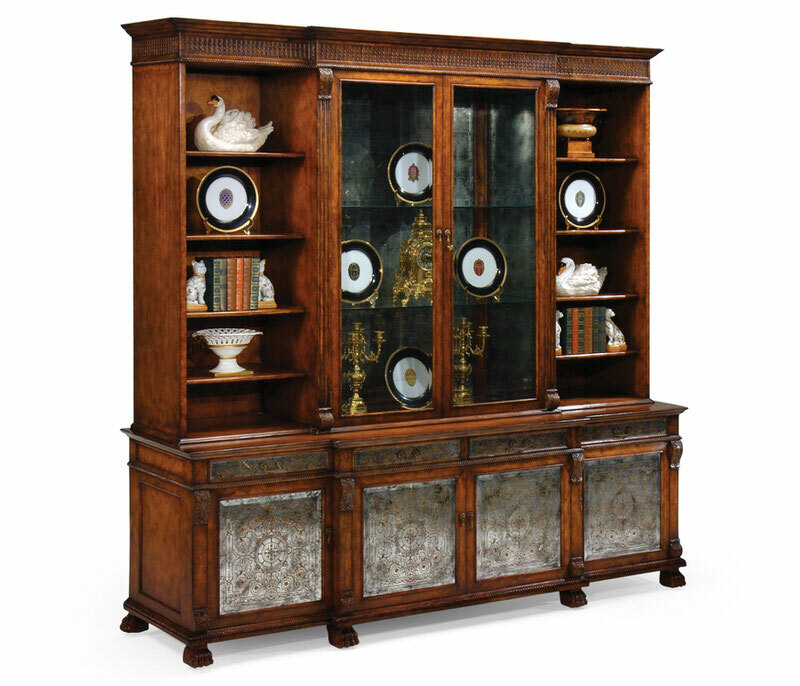 Decorative large bookcase in classical style, shallow carved frieze, pair of glazed doors enclosing a mirrored centre section with adjustable shelves, flanked by open shelves and a four door, four drawer base unit with églomisé glass finish. The whole raised on finely carved lions paw feet. 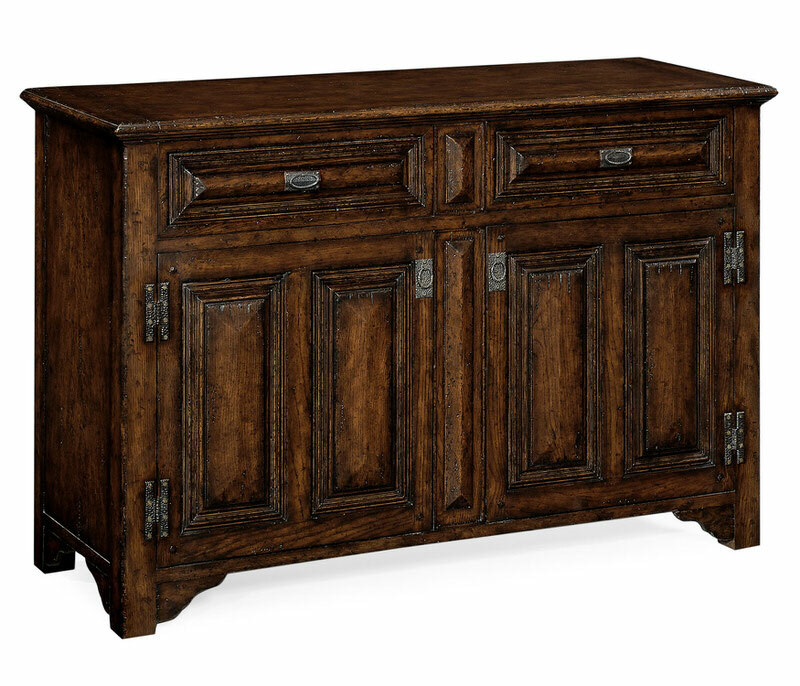 Range sensitive lighting with touch controlled dimmer. 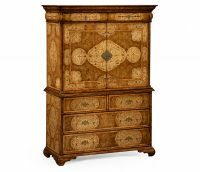 Walnut and burl walnut cabinet on chest, twin doors and two drawers to the top section with finely inlaid contrasting panels of swirling arabesque ‘seaweed marquetry’, fully lined interior with inlaid drawers and a small cupboard as well as a slide, above two short and two long drawers with further inlay. 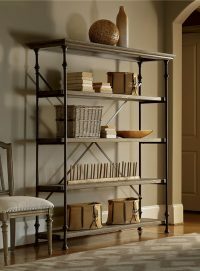 Brass hardware to the doors and drawers cast using the “lost wax” technique. 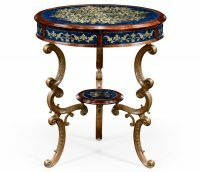 Rococo style mahogany and brass side table with hand painted églomisé finish and intense lapis blue tone. 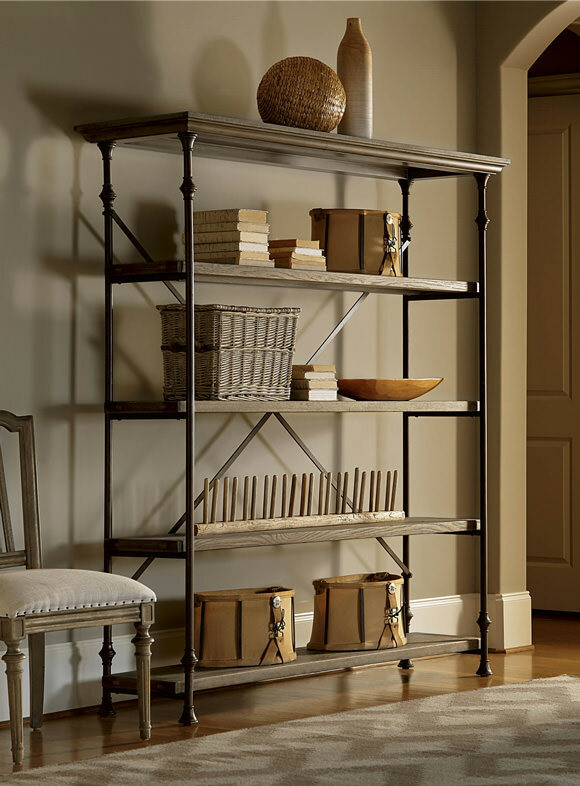 Finely cast brass legs support a small round shelf. 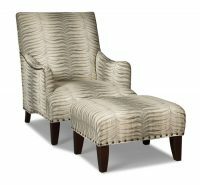 This transitional lounge chair has a comfortable tall back. The slim arms are saddle shaped. 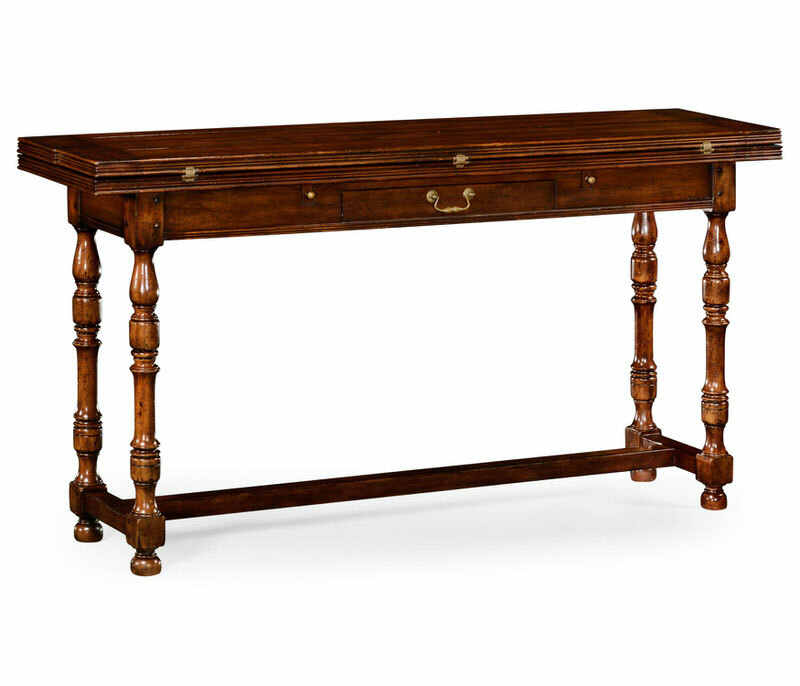 The simple wood legs are tapered. 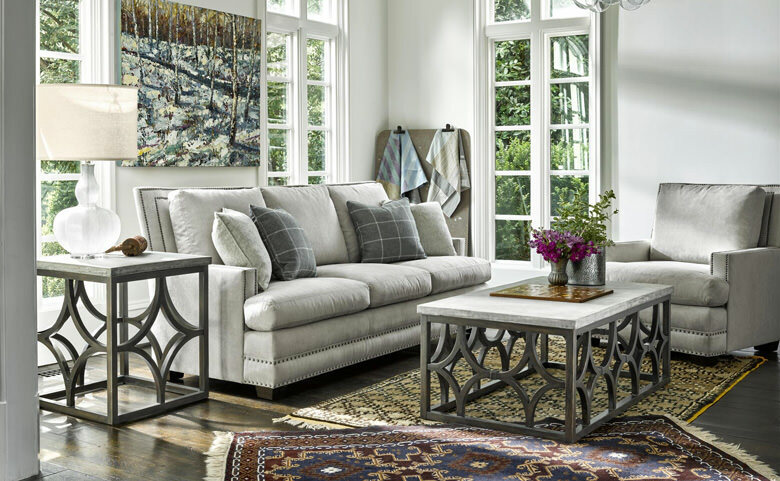 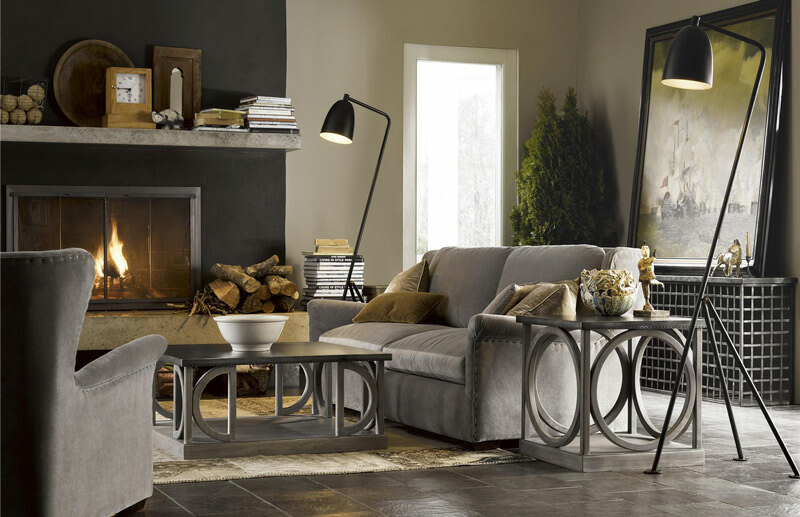 This ottoman is sized and styled to match the 5462-01 chair. 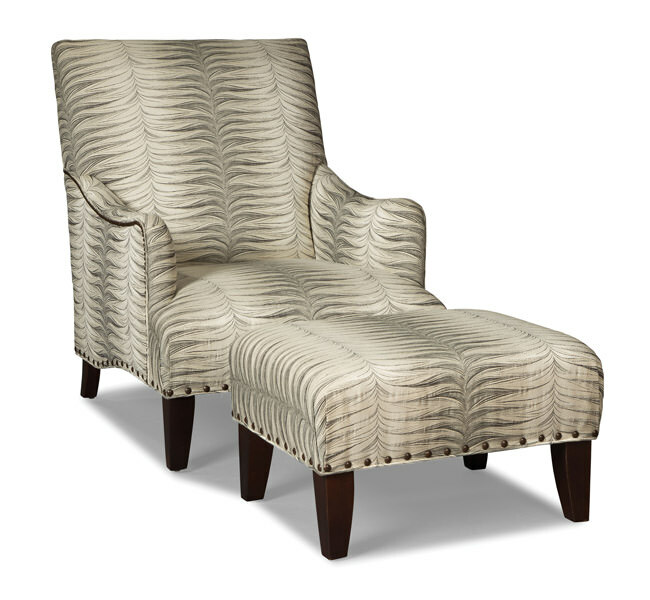 This smooth, rounded top wraps down to the legs. 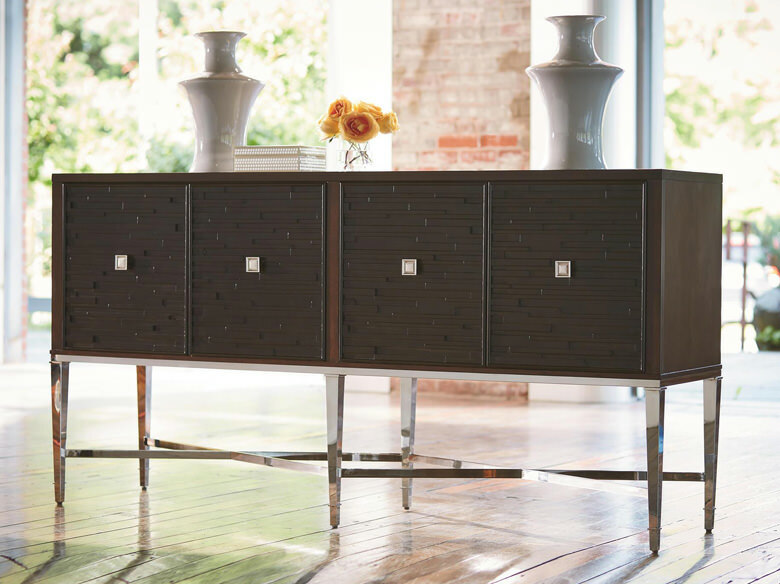 Two polished stainless steel doors with beveled glass. 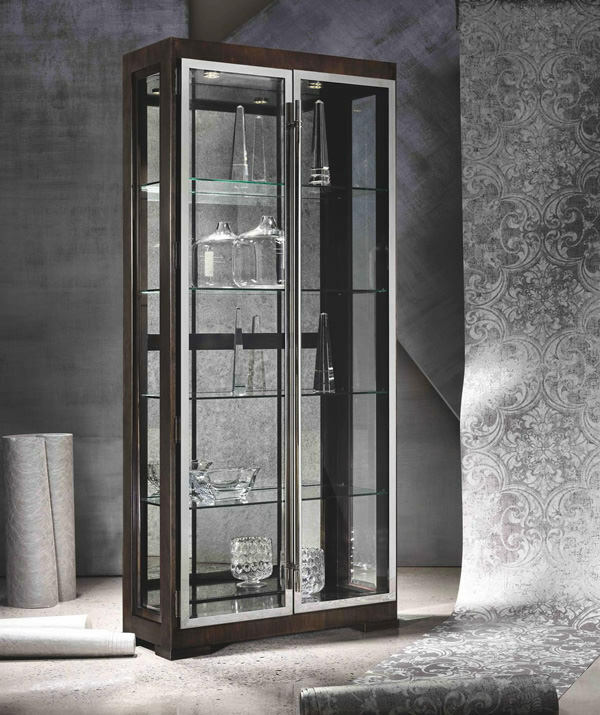 Beveled glass in the end panels. 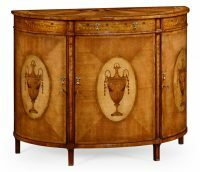 Interior back is antique mirror glass. 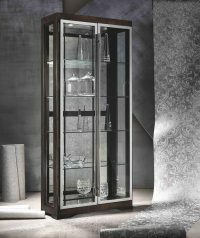 Four adjustable glass shelves. 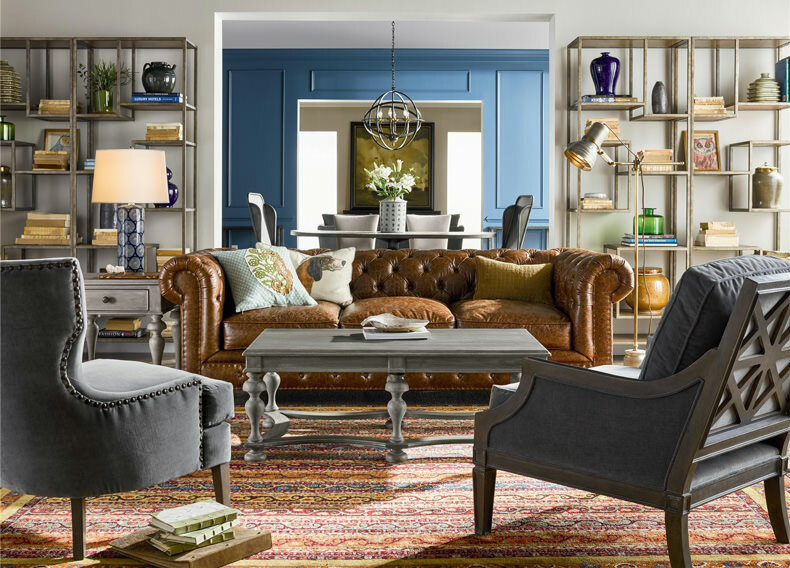 Two interior lights.